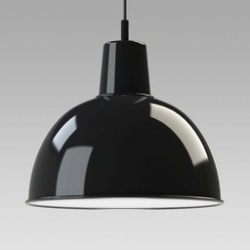 MONA is a suspended luminaire series in a classic retro design which fulfils both the demand for decorative and emotional lighting and the aspect of technical and functional illumination of goods at a high level. To be particularly emphasized is the efficient and powerful LED technology in conjunction with reflectors with various beam angles. 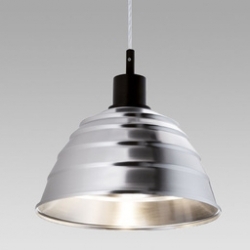 Alternatively, MONA is also available for lamps with an E27 socket. In addition, MONA meets the BAP standard and is hence suitable for lighting at computer workstations. PIZZA is a downlight series. 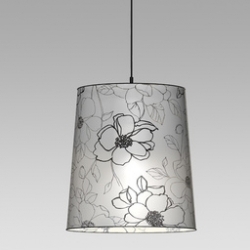 The luminaires are closed with white opal acrylic glasses. Thus the impression of a hovering disc or the appearance of diffused daylight falling through an opening in the ceiling is created. PIZZA is suitable both for ambient lighting and for the entrance areas or points of decoration. COLLECTION, supplementing the Classic family, is a further series of suspended luminaires which likewise harmoniously unites the aspects of emotionality and technology. Particularly to be emphasized, however, is the possibility of individual design of the luminaires; as desired, the most varied materials can be used for the lamp shade. But there are also no limits to creativity for the basic shapes. “Create your own identity” is the principle of COLLECTION. The Piazza suspended luminaire series is presented in an appealing, geometrical design. 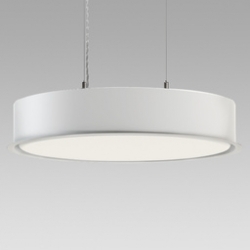 The luminaire was developed for great room heights of five meters and more. 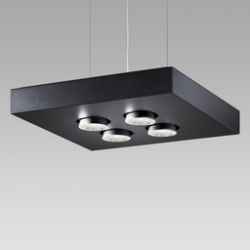 Due to the use of different beam angles it is recommended for a homogeneous and also for accentuated ambient lighting. Piazza is available in a square and also in a round version with diffuser plate for functional light with an attractive long-distance effect. The innovative reflector technology of the suspended luminaire series MAXX with various interchangeable reflectors produces non-glare light and thus provides high visual comfort. Various shade variants permit optimum adaptation to the interior.